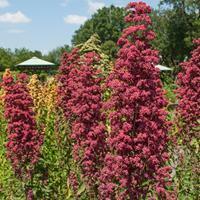 Once called Prince’s Feather, this amaranth adds bold texture to garden beds, great in sunny locations wih sunflowers and salvias. It is also an unusual addition to veggie gardens for the greens are delicious and very high in important vitamins and minerals and the abundant tiny seeds are a popular and nutritious grain. Young plants resent root disturbance. Self sows. Plant: Somewhat shrub-like with oval-lance shaped deep green leaves and orangey-green stems. Flowering: Upright yet spreading clusters of orangy flower spires. Great for dried arrangements. I just loved the size of these flowers. I couldn't believe I grew this from a tiny seed & I still have flowers in November. I am from zone 7a & started them outside in April. I prefer to start seeds in a flat tray outside so I can tell which is the seddling or weed insted of direct sow.